Well, this is the post #100. But I will not make a project summary nor announce a new miniBloq version (sorry!). This time is about my good friend Linz. As far as I know, Linz was the first employee of Sparkfun's Education Department. 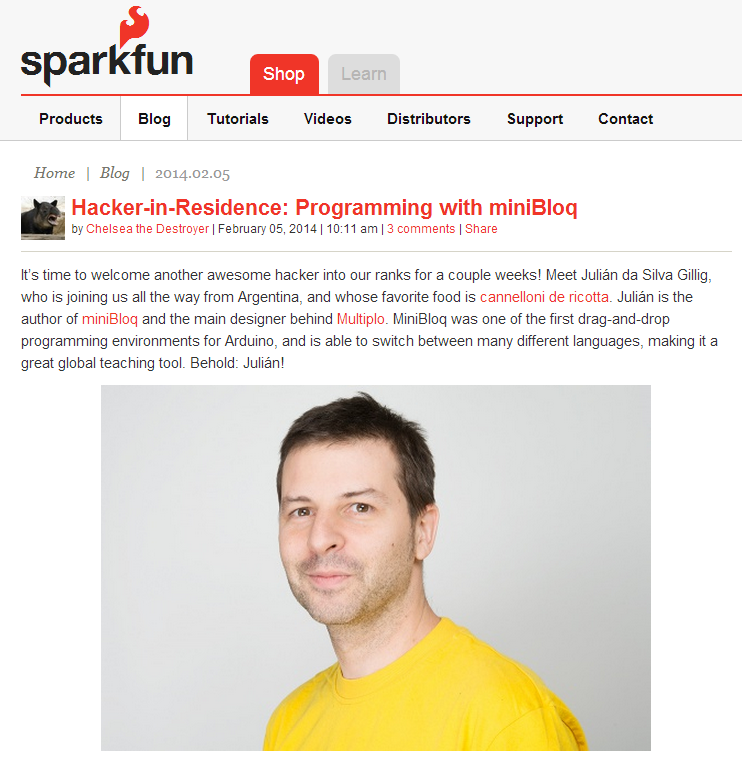 He also was the person who accompanied me when I went to Sparkfun for the Hackers In Residence program, where we extended some of miniBloq's capabilities. But Linz is not at Sparkfun anymore. For several months (and for the second time in his life), we was in Africa, just teaching technology to a lot of people. And now, Linz wants to return there, specifically to Uganda. And that's why he needs some help from us. 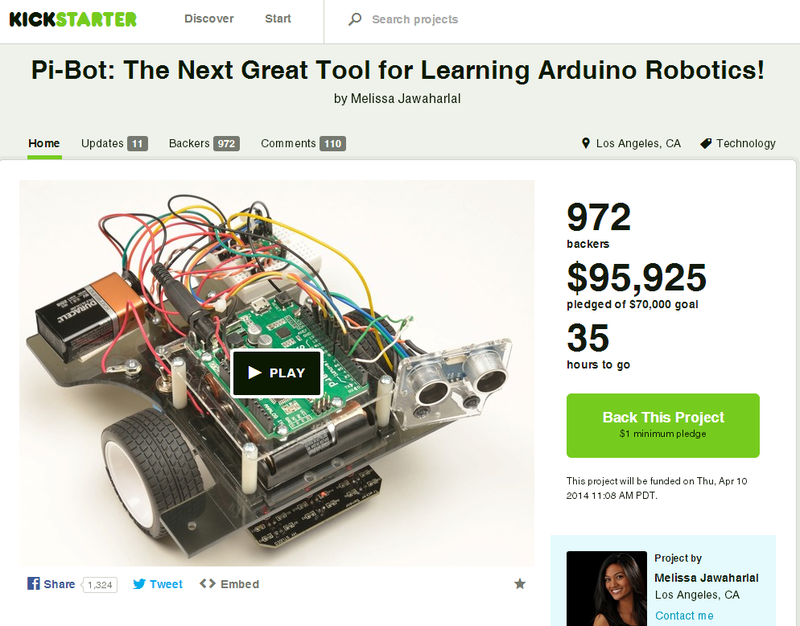 To achieve that goal, he launched a Kickstarter campaign. All the details are on that link. Here is another interesting link describing Linz's work. Sharing also helps! miniBloq + AERobot on Wired! AERobot is the result of a development by Mike Rubenstein and Radhika Nagpal at the Self-Organizing Systems Research Group at Harvard University. It's a super cheap (< $10) robot, and it receive the first prize in the software category (guess which software they have used!) 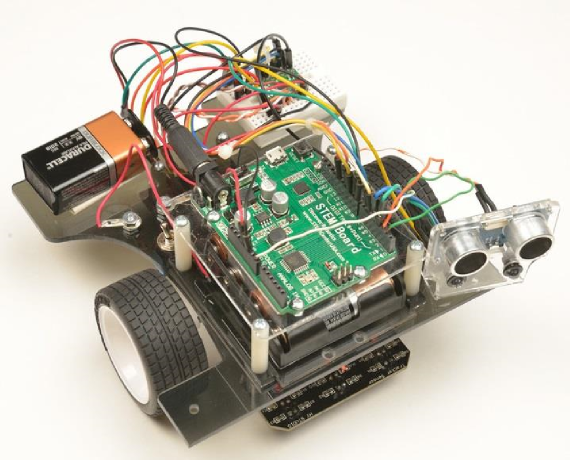 and the second prize in hardware category, at the AFRON Ultra Affordable Educational Robot Design Challenge (2014). Congratulations for the AERobot team! New beginners' guide for Pi-Bot and miniBloq! 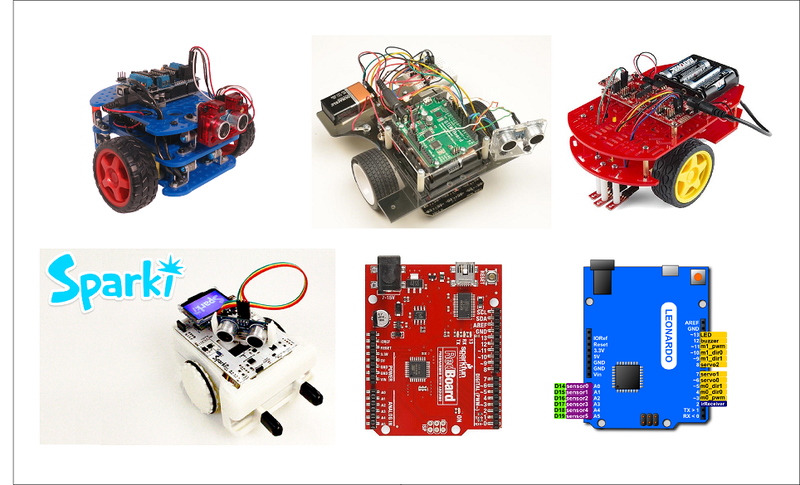 There are a lot of other useful documents about robotics in their Pi-Bot Downloads page. 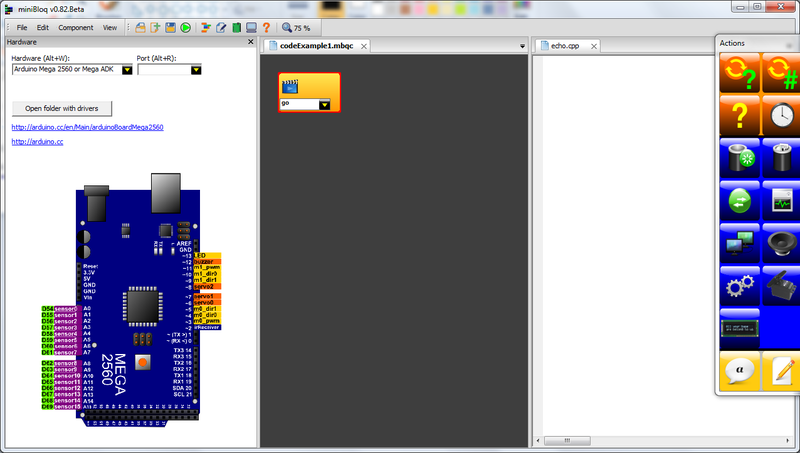 Also, there is a special miniBloq version, optimized for the Pi-Bot, which can be downloaded from here or from here. I want to say thanks to the STEM Center USA team for this great work! What does this mean? It means that at the very beginning of your program, it will do nothing but calling the go() function. And what is the go() function? Is a function that you will write by your own, and where your program will start. It's like the main() function in C/C++, but we can not name it main() because that name is already used internally by the Arduino kernel (I will post more about this soon). 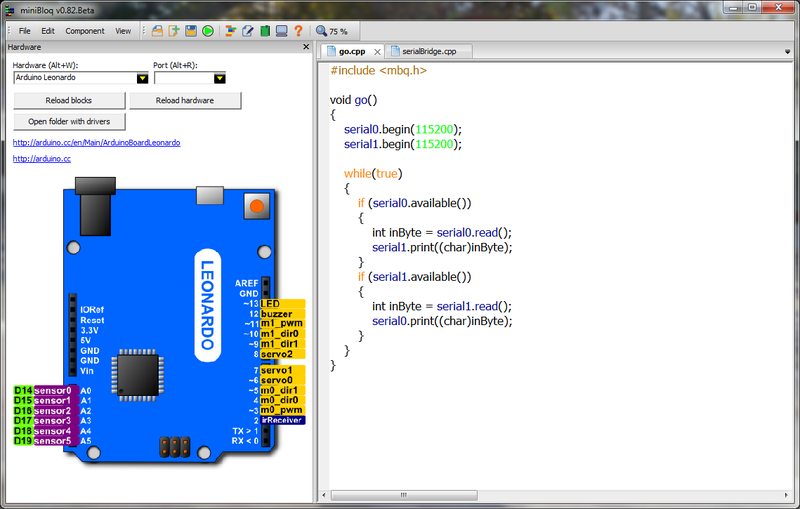 In "Arduino terms", the go() function is equivalent to the setup() function. Finally, if you want to use blocks to test, you just need to select initBoard() in the Start block, and start adding your blocks there. The files that you have added will remain there (unless you close them). 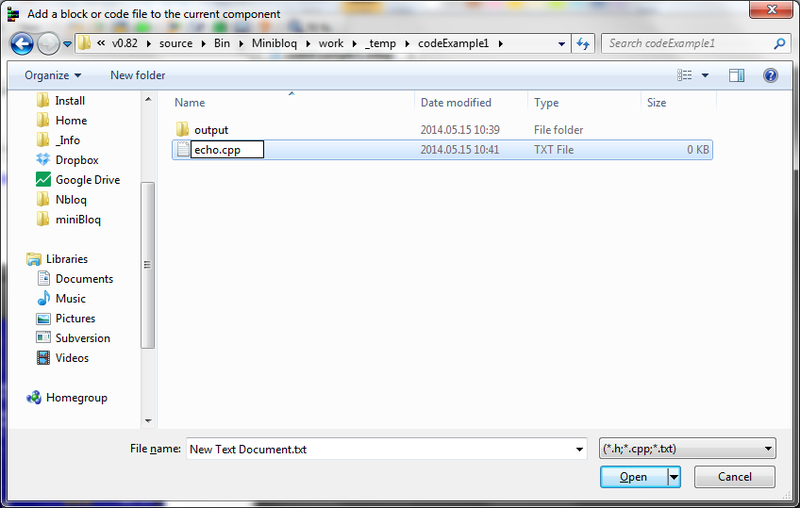 Once you want to return to the text coding, just select go() again in your start block. In a future post, I want to show you how to work with multiple file projects. But probably you can just try to experiment a bit by yourself using the Add file feature. These are good news for all the developers, manufacturers and advanced users who want to add new hardware and custom blocks. Now you can do it just editing XML files! I will work on the Developer's Guide in the next days to explain how. 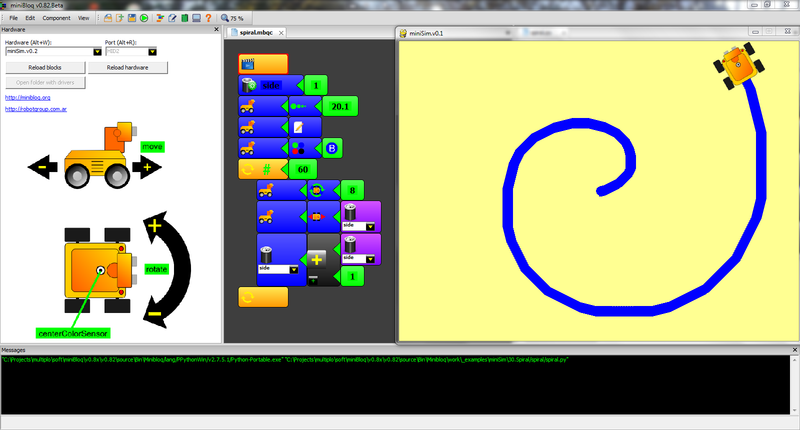 Or even combine graphical with text-based programming anytime during the development of your program. 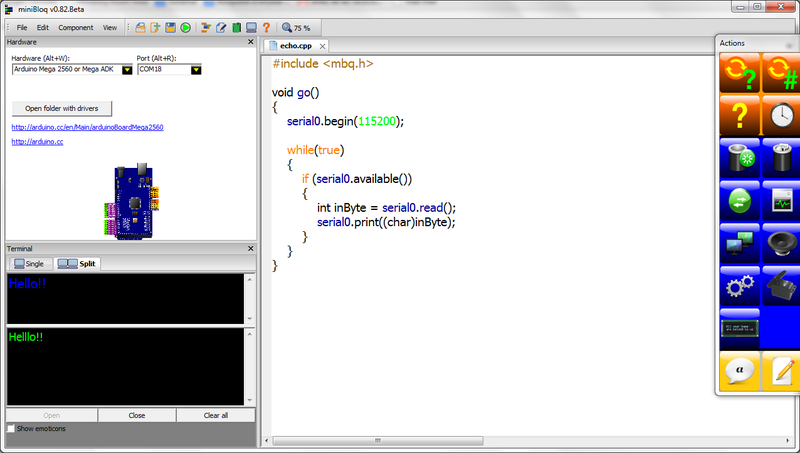 The new miniBloq can even work as a (simple) standard IDE! miniBloq is now faster and it remembers its settings (like the selected hardware, the screen dimensions and the serial port). 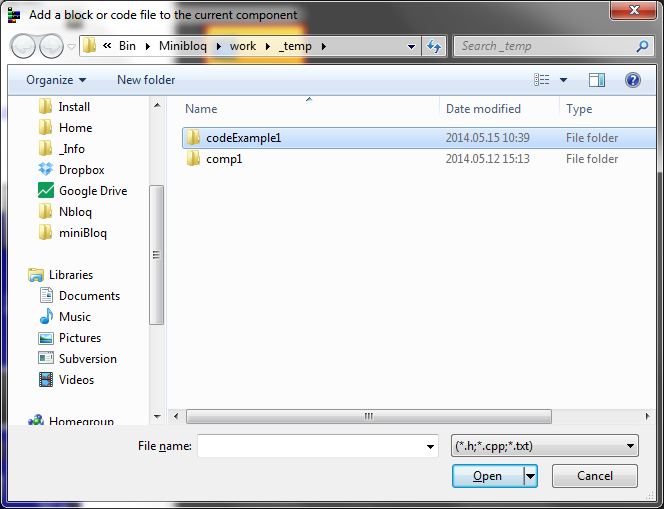 Also, you can associate mbqc files to it in order to open them with double click. Of course, there are more blocks and bug fixes. A LOT of examples! And they has been rearranged. 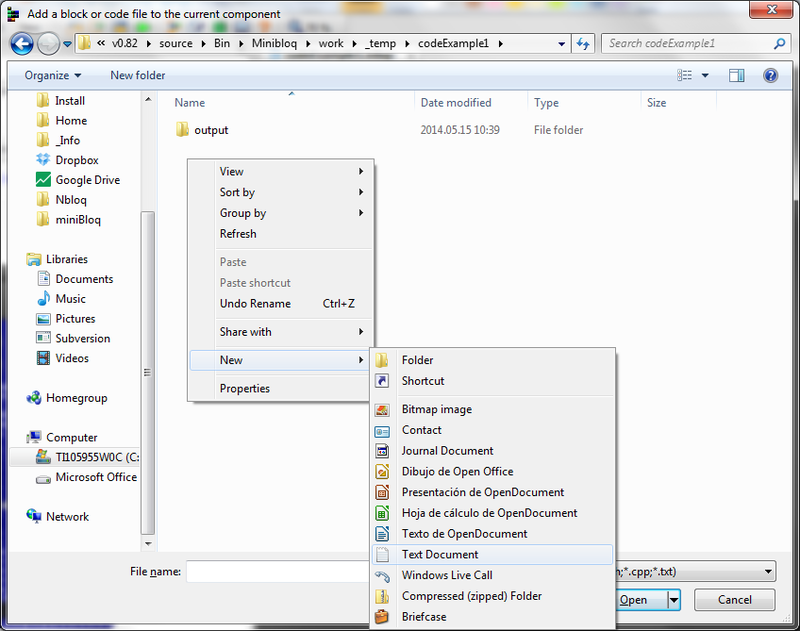 Check them with the File-Examples menu, and remember that most of the examples are under the DuinoBot folder. 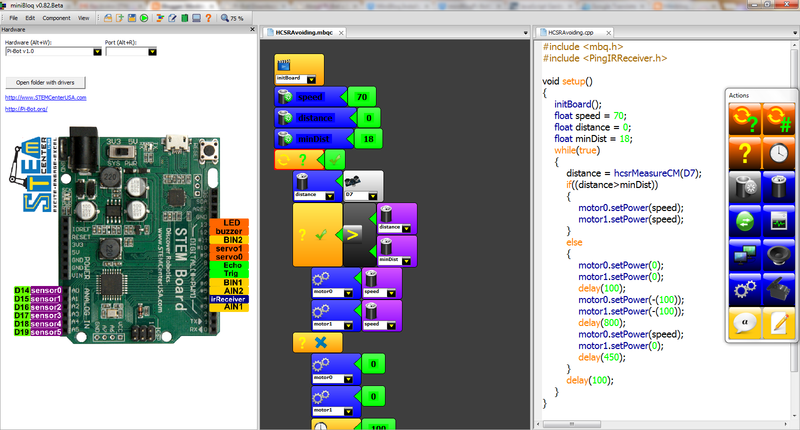 And don't worry if you don't have a DuinoBot board: most of those examples run on an regular Arduino. Advanced users will find this really interesting: miniBloq now includes Portable Pytnhon and OpenCV to do some more advanced activities with interactive programming (not graphical yet) and computer vision. 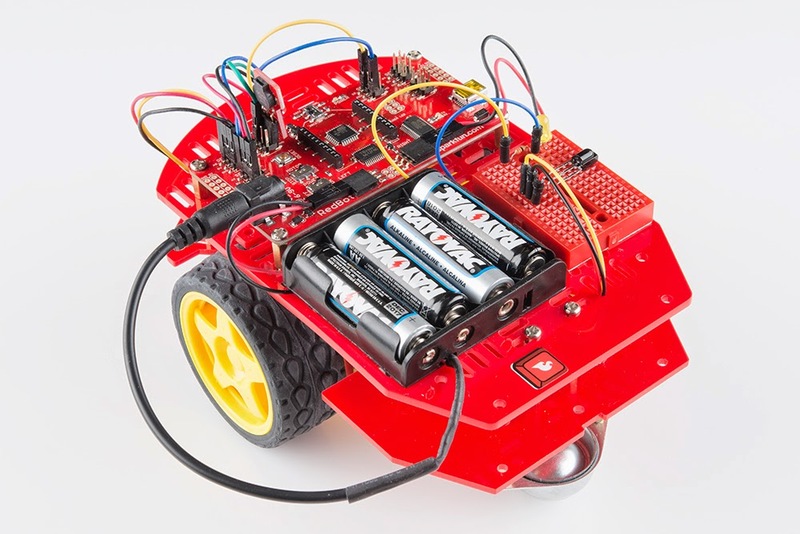 Here is a tutorial from SparkFun, wrote at during my Hackers In Residence early this year (thanks Linz!). This is the direct link to get the v0.82. Enjoy! To read more about all the changes (and known issues), take a look to the changelog. Finally, as many of you already know, miniBloq has moved to GitHub. So the complete source code is available from the online repository: https://github.com/miniBloq/v0.82. You can both replicate the repo, or just use the Donwload ZIP button there to get the complete source code. 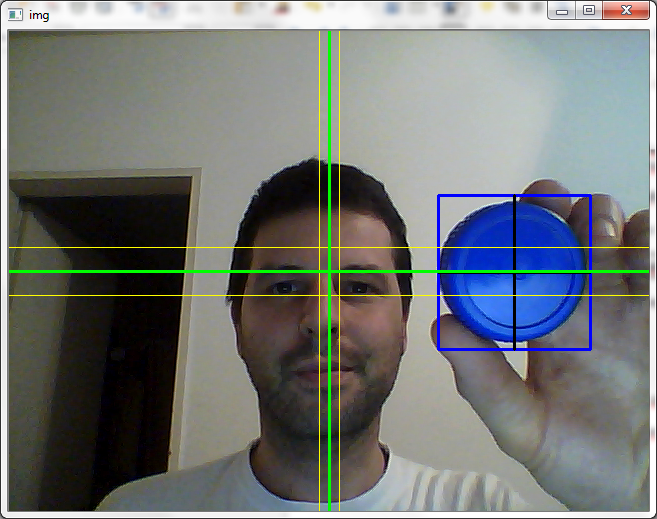 miniBloq + RedBot + OpenCV + Free tutorials! 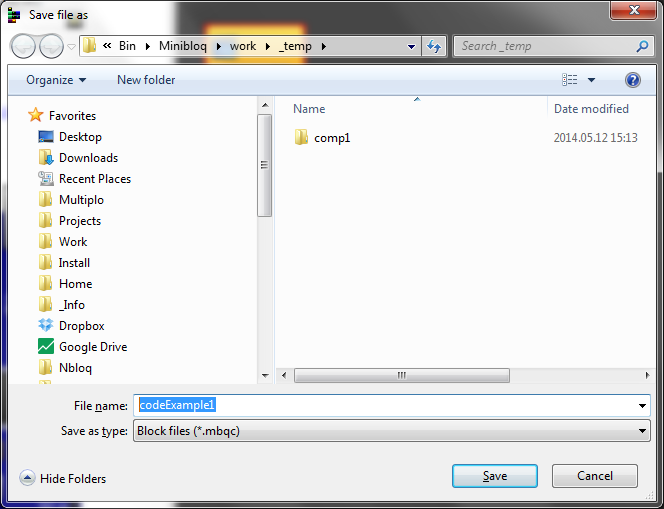 As always, all the code for the examples is packaged inside the _examples folder in miniBloq's official distribution. Thanks Michael for the links! You can read more about miniBloq + Pi-Bot here. By the way, the upcoming v0.82 version will arrive with a lot of new features. Among them I can mention the capability of adding text based functions to a program, the new XML backend which provides an easy way to add new hardware and blocks, and a small 2D robot simulator called miniSim (more on this soon!). So stay tunned! 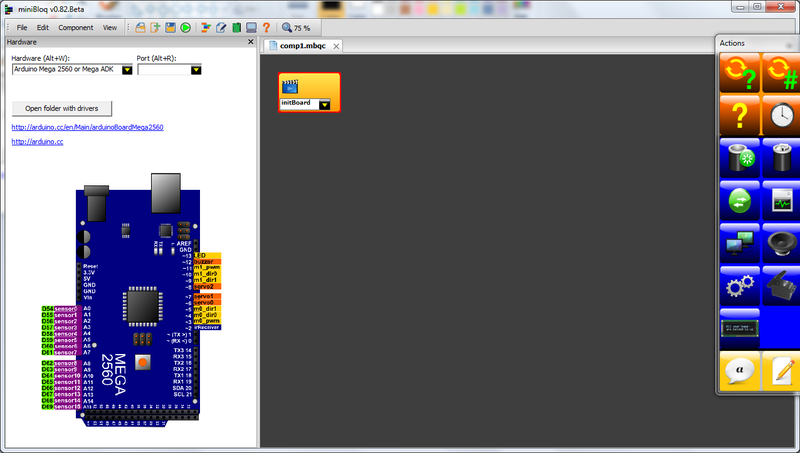 miniBloq + SparkFun + upcoming v0.82 version! I know: no Linux version yet? I'm sorry about that, but as most miniBloq's Linux users know, we port it after the official release of the Windows version. And when will this happen? Most probably after I have finished my work at SparkFun's Hackers In Residence Program, where we are integrating SparkFun's hardware (sensors, robots, etc.) into minBloq! Thanks SparkFun! I have some more really exciting news (mmm, like a 2D small robot simulator), but I will be posting about them on the next days. So stay tunned!